Labor Day Weekend has passed, the kids are back in school and depending on where you live you may smell fall in the air. I currently live in the Phoenix area, and don’t experience the typical change of seasons; however the temperature has dropped below 100. So for me too, with cooler weather my thoughts turn to soup. What says welcome to your new home after a day of unpacking or a day at your new office like the aromatic smell of a simmering pot of soup? 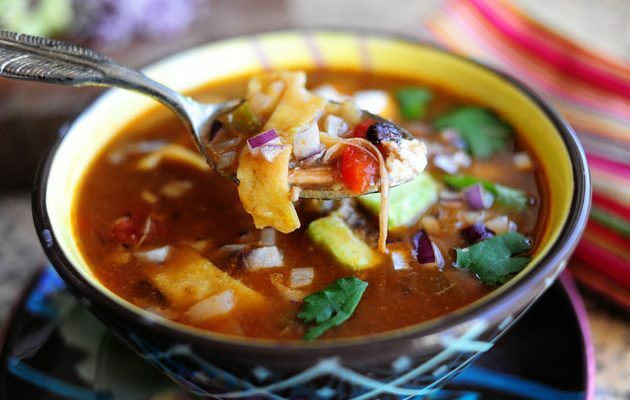 Since moving to the Southwest the following recipe is one of my family’s favorites. Cut 5-7 tortillas in half and then cut into thin strips. Heat ½” of oil in a skillet and when hot add tortilla strips a few at a time and fry. Turn at least once and fry about 3 minutes or until golden brown. Remove from oil with a slotted spoon and drain on paper towels. Repeat with remaining tortilla strips. In a 6 quart stockpot sauté garlic and onion until onions caramelize. This will take about 20 minutes, stir occasionally. Add tomatoes, tomato paste. 3 coarsely chopped corn tortillas, jalapeno and 2 cups of the chicken stock. Bring to a simmer and cook for about 15 minutes. Remove from heat. Place contents of pan in a blender and puree. Return puree to pot. Add remaining stock and chicken, simmer for an additional 15 minutes. Add beans and heat thoroughly. To serve place a few corn strips in each bowl. Fill bowl ¾ full with soup. Top with cheese, avocado, cilantro and corn strips. Pass limes for squeezing. * In a hurry, these are now available already prepared in many stores.